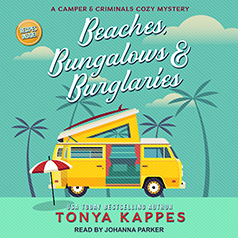 Tonya Kappes presents the first book in her Camper and Criminals Cozy Mystery series. Mae finds herself homeless, friendless, and penniless. All hope isn't lost . . . the only thing Mae got to keep that the government didn't seize is a tourist camp ground, Happy Trails, in Normal, Kentucky. By the look of the brochure, Happy Trails has plush Kentucky Bluegrass, a crystal clear lake, and a beach chair with her name on it. Mae figures she'll take a couple weeks' vacation with her toes dipped in the lake. Mae quickly finds out that Happy Trails and the citizens of Normal were also victims of Paul's schemes, making her lower than than lake scum in the residents' eyes. Mae doesn't think things could get much worse, but as luck would have it, Paul West has escaped from prison and is found dead, murdered, floating in the Happy Trails lake. Time is running out for Mae to prove that she's innocent and nothing like her husband. If only she could get someone to believe her before the curtain is closed on this Hollywood namesake.